You are here: Home / Life of A Fairy Bra Mother Blog / Product Info / Craftsy Black Friday Sale! 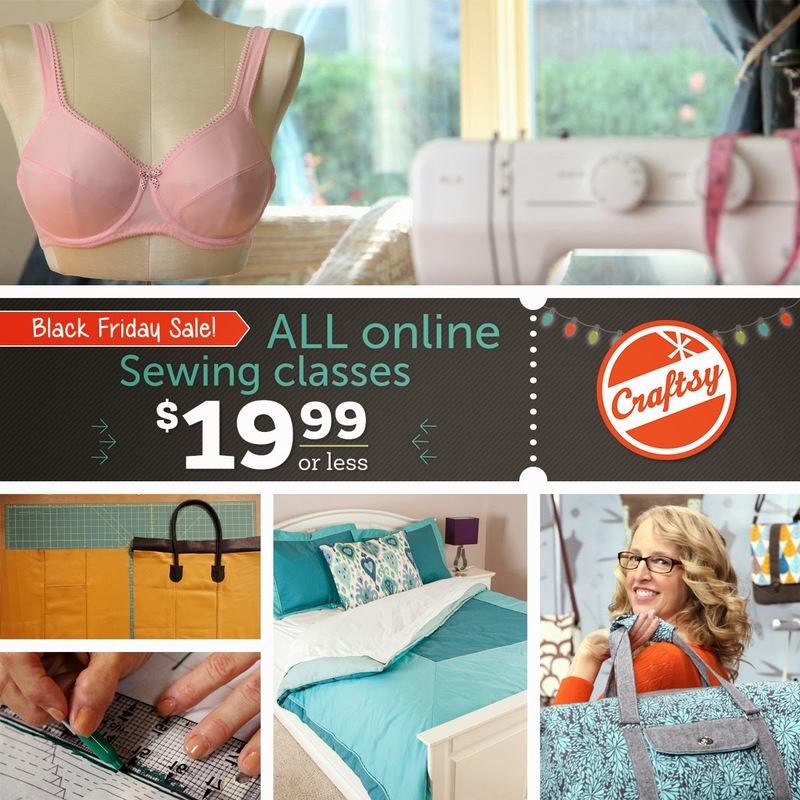 Craftsy Black Friday Sale – I am so excited to share the news that my Sewing Bras: Construction & Fit is the TOP-SELLING sewing Class at Craftsy! yes, we have broken all sales records and it’s only been two months since the class launched! Thanks to all of you who have purchased the class! If you haven’t seen that class – the BEST time to buy it is NOW! Let me share the news about Craftsy’s biggest event of the year! I know that this is the season to shower your loved ones with gifts, but why not invest in yourself, too? Craftsy is making that just a little easier by marking down ALL online Sewing classes to $19.99 or less, including mine, today through to Monday December 1. Give the gift of learning here! Plus, Craftsy is so sure you’ll love your classes, they’ll refund the full value if you are not totally happy with your purchase. There is really no reason not to buy a class for yourself, and maybe even for a lucky loved one (what about your sewing sisters?). Just remember, move fast because this amazing sale ends on Monday and I’m told you won’t see these prices again anytime soon! Thanks for spending a little of your time with me this year and with my wonderful Craftsy family. I hope you’ll take a moment and do something special for yourself this season. Purchase a Craftsy sewing class today for 19.99 or less during their Black Friday Sale and invest in time well spent this year. Be sure to hurry because the sale ends Monday December 1, 2014 at 11:59 pm Mountain Time. Congrats on breaking a record. I can proudly say I was one of the first signed up the day the class was posted on Craftsy. You are a fabulous teacher! I'm almost to a perfect fitting bra but life got in the way, darn it. If you are anything like my family, we can't MOVE after Thanksgiving dinner, let alone sew! Actually, I am going to film a second class in January. But shhhh….it's a secret! Thank you so much for sharing your bra wisdom good Fairy Bra Mother. Love your books too. I love to learn everything about sewing lingerie. Congratulations re being the top selling class! I really enjoyed watching your class the first time through and when I get some time after christmas I plan on sewing myself up a few bras – I've always wanted to attend a class but there aren't any here in poor little Adelaide, Australia – or at least none I've found! Here's hoping they've got you lined up to do another class! I just finished your class videos and thought it was brilliant! I loved it. I can't wait to get home after Thanksgiving and start bra-making. The class really is wonderful!